Take a Google Maps virtual tour of Calle Olvera and it's sorroundings. 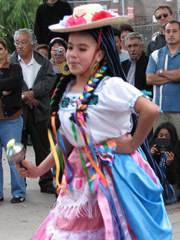 A yearly summary of the festivities held at Olvera celebrating many events. Avila adobe, the oldest adobe house in Los Angeles. A list of recommended websites, blogs and videos to explore Olvera. We are asking you to please donate to support traditional events at La Placita Olvera. You can help provide joy and culture to thousands of children and community members by donating to support Dia de los Muertos 2010. For 80 years, the Olvera Street Merchants have held free traditional events such as Dia de los Muertos, Posadas, Fiesta de las Flores, Blessing of the Animals, and many more. For the 2009-2010 year the merchants had 100% of our funding for events cut. We have worked tirelessly to persuade city leaders that free arts and cultural events at Olvera Street are important and that funding should be restored. Because of broad community support and community donationsas well as the donations of unpaid labor by many artistswe have been able to continue some of our events. In addition, we have been promised that our events budget will be restored in 2011. However, we do not have a contract for our events yet, and this means that Dia de los Muertos 2010 does not have funding yet. We are asking you to please give what you can to SAVE FREE CULTURAL EVENTS and DIA DE LOS MUERTOS! OSMAF is a registered 501c3 nonprofit organization and our tax identification number is 20-2021614. Imported woodwork from the state of Oaxaca, and colorful Piñatas adorn our shop. A mariachi group playing at Calle Olvera's 75th Anniversary celebration. Tell us all about your childhood memories at Olvera on our guestbook. Copyright © 2014 Calle Olvera. All Rights Reserved.